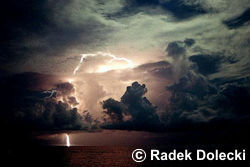 Positive lightning strike, copyright by Radek Dolecki - Electric Skies. The previous section describes what is called "negative lightning", because there is the transfer of negative charge from the cloud to the ground. However, not all lightning forms in the negatively charged region under the thunderstorm base. Some lightning originates in the cirrus anvil or upper parts near the top of the thunderstorm, where a high positive charge resides. Lightning that forms in this region follows the same scenario as previously described, but the descending stepped leader will carry a positive charge while its subsequent ground streamers will have a negative charge. These bolts are known as "positive lightning" because there is a net transfer of positive charge from the cloud to the ground. Positive lightning makes up less than 5% of all strikes. However, despite a significantly lower rate of occurrence, positive lightning is particularly dangerous for several reasons. Since it originates in the upper levels of a storm, the amount of air it must burn through to reach the ground is usually much greater. Therefore, electric fields associated with positive Cloud-to-Ground (CG) strikes are typically much stronger than those associated with negative strikes. The flash duration is also longer with peak charge and potential up to ten times greater as compared to negative CG strikes; as much as 300,000 amperes and one billion volts! 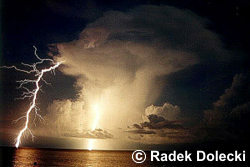 Some positive strikes can occur within the parent thunderstorm and strike the ground beneath the cloud. However, many positive strikes occur near the edge of the cloud or from the thunderstorm's anvil from which a strike can occur MORE THAN 25 MILES AWAY from precipitation. If you hear thunder, you are close enough to lightning flashes that you could be struck regardless of where the Doppler radar says the storm is located. Also, positive flashes are believed to be responsible for a large percentage of forest fires and power line damage. Thus, positive lightning is much more lethal and causes greater damage than negative lightning. Bolt from the Blue photo, copyright by Al Moller. Positive lightning can be the dominant type of cloud-to-ground during the winter months and in the dissipating stage of a thunderstorm. Positive lightning has been identified as a major source for the recently discovered sprites and elves. Sprites and elves are most likely lightning discharges but occur from 18-60 miles (30-95 km) in altitude, well above the parent thunderstorm. Finally, there is bipolar lightning, lightning that actually changes its polarity (positive becoming negative or vice versa). It is no less dangerous than any other type of lightning but shows that we live on a complex planet with many aspects we do not fully understand.